About once a year, I have to tame the area in and around my recipe box. The wooden box sits on the baker's rack, out of the way, and periodically becomes so stuffed with recipes torn from magazines and scrawled on papers, they spill out to stacks atop and beside the box that should house them. I take the recipe box to the kitchen table and spread out the jumble of papers, lining up my tools for the next hour of wrestling this mess into submission: index cards, glue sticks, scissors. It's a quiet task and one I actually look forward to tackling. Time is the only reason it's not organized more often. I trim the shreds of paper, removing the jagged edges and replacing them with clean cuts, then glue the thin magazine paper to an index card, quickly making it fit uniformly into the wooden box under its corresponding tab. I finish the process by polishing the reddish wood with a fresh coat of pine oil, restoring the simple beauty of this little wooden treasure. Where others see a plain recipe box, I see memories, and this year's recipe wrangling was no different as each was carefully tamed and placed in its proper home. My Dad and I built the box together (well, it was mostly him, but I was there) from wood that was rather close to home. Five feet from the back door, actually. When the cherry tree in the backyard died after a harsh winter, Dad had it cut and milled into lumber, from which my recipe box was built. He made several before -- for Mom and both my sisters -- but mine was made from wood with special meaning. I remember how he sketched it on paper as he asked me how I wanted it embellished. Curved base? Straight lines? Molding or applique? The time between those sketches on paper to a finished product always moved quickly in his workshop, his experience making it look so easy. When I look at the box, I remember the cherry tree, growing much too close to the southeast corner of the house and rather unbalanced in appearance from a severe pruning given by the previous owners. It was the tree that shaded my father when he stood at the corner of the house, watching me mow the yard as a teenager. I can see him clearly: white t-shirt, khaki pants, and work boots. He held his pipe in his left hand and reached for his 'nail' from his right pants pocket. The nail was a piece of metal, flat on one end and spoon-like on the other, which he used to stir and tamp the tobacco into the bowl of his pipe. Stir, stir, stir. tap, tap. Stir, stir, stir, tap, tap. The rhythm was consistent in his preparation to light the thing. He must have watched me mow the yard hundreds of times. At the time, my teenage mind found it annoying, but when asked why he did it, he simply said he like to see the yard freshly cut. After hearing that, it didn't bother me so much. He was indeed watching me mow, from his spot under the cherry tree, when the mower threw a rod, instantly stopping it in its tracks. I can still see him drop his head, shaking it in amazement, as he knew I forgot to check the oil before I began. Hard lesson learned. Even now, when I mow my yard at a house my father never saw, on occasion I glance to the southeast corner of my house and for a split second, expect to see him there. Only a downspout looks back, and I smile at how my old habit of looking for him at the corner of the house has never really left me. Twenty-five years since he last walked this earth, and a part of me still looks for him to watch me mow the grass. Of course, now I am sure to check the oil before I begin -- every time. Maybe I'm just looking for him to nod with a "yes, I know you checked" look in his eyes. Though so many things have drifted in and out of my life, the recipe box remains. 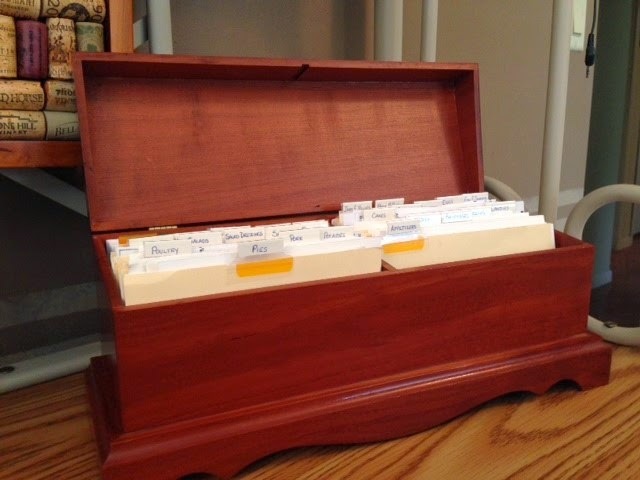 It serves as the one lasting tangible gift from that tree -- my custom designed, hand made cherry recipe box crafted from materials in our back yard which now houses all the recipes for every meal I need. Funny how the cherry tree that never produced an edible cherry in its life now holds instructions for every tasty morsel this household knows. And tucked between its individual cards stained with meals of many years, are more memories than the unfamiliar eye would ever see. But I see them. Each time I lift the lid and search for a familiar card, the memories reach out from within and take me by the hand, momentarily transporting me back to simple days in the backyard, fresh cut grass, and a lopsided cherry tree. Hi Fil -- So glad you are here and glad you enjoyed the post. Hope you are able to stop by again sometime. I came here via Fil's blog and quite agree - a lovely, thoughtful post. You made me remember so clearly my own dad tamping down his pipe when I was a child - although he had a special tool like a penknife that folded in the sharp part and left the flat part on the outside. He managed to kick the habit some years ago but I still love the smell of pipe tobacco. Hello Senco -- Happy you found me (and thank you, Fil for showing the way). After my dad died, I kept one of his pipes in a plastic bag and it still smells like my memories, even after all this time. Hope you come back again to read more in the future. Thanks! I love this. So beautifully and creatively written. 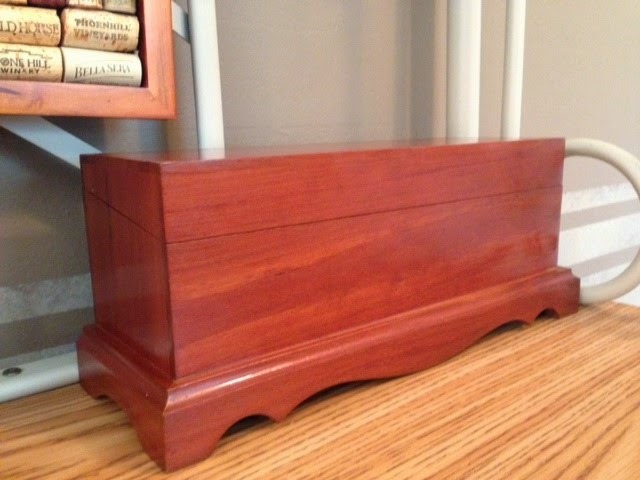 My very special handcrafted recipe box is made out of walnut. Periodically I have to sort through all of the recipes I have stuffed in the recipe box. I also have a pipe, 'nail', and a pipe holder.